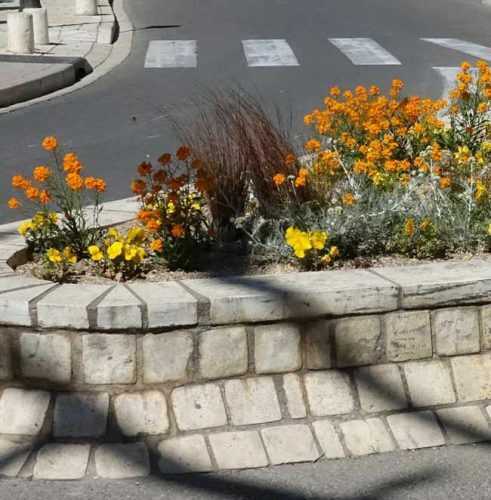 I’ve admired the flower displays on French roundabouts before, but here the road islands have a distinctly Provençal flavour. Everyone is unique, but each displays a microcosm of Mediterranean plant life. 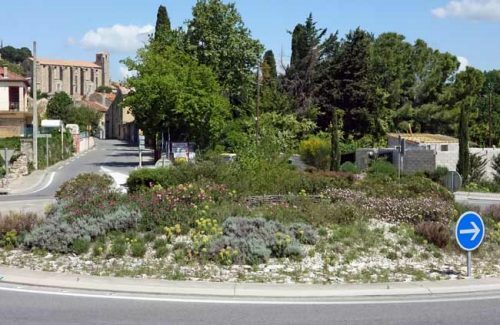 At a road island in St Rémy de Provence, it’s all jaunty yellow-orange, underpinned with silver foliage and highlighted with bronze grasses. Perfect inspiration for a Mediterranean style garden border back at home. Here are some cheery yellow/orange flowers to bring Mediterranean sunshine to your back garden! 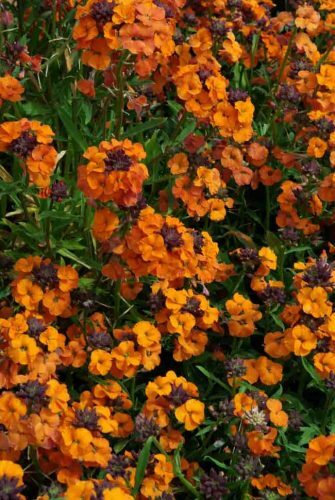 The common wallflower, Erysimum cheiri, has scented, vivid yellow-orange flowers in spring. Erysimum ‘Bredon’ has cheery yellow flowers while those of E. ‘Apricot Twist’ are warm orange. 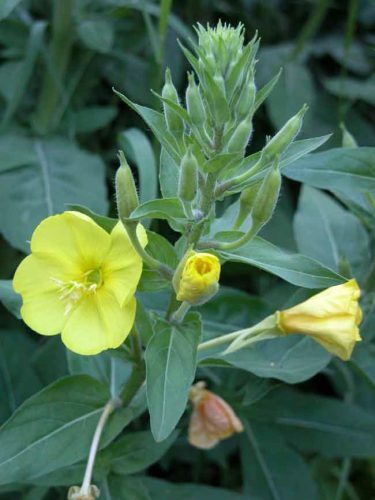 Oenothera macrocarpa (Evening Primrose) is a low perennial, growing to only 15cm in height. Its bright yellow flowers appear from late spring right through to early autumn. The Large-flowered Evening Primrose – Oenothera glazioviana – is an upright biennial. Huge, pale yellow flowers open in the evening, in summer and autumn, on stems up to 1.5m tall. 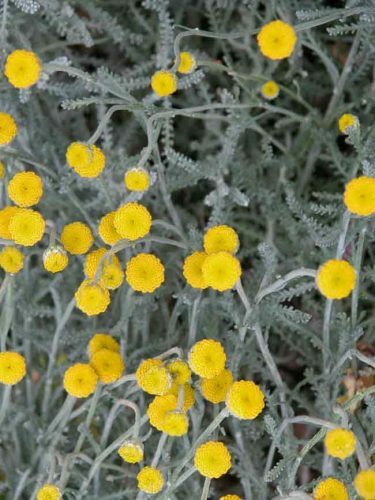 For silvery foliage and bright yellow flowers, try Santolina chamaecyparissus (cotton lavender), which has deeply dissected silvery leaves and bright yellow button-like flowers. 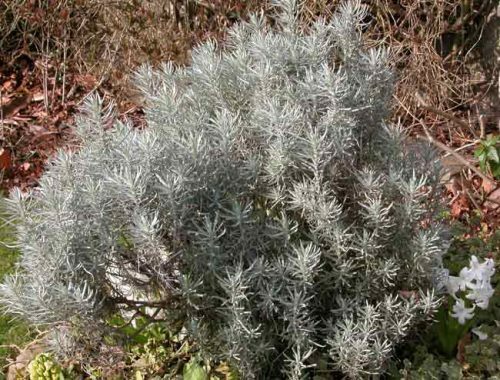 Helichrysum italicum also has the typical silvery leaves of Mediterranean plants and has yellow flowers in summer. Its evergreen leaves are curry-scented, giving it the common name of curry plant. 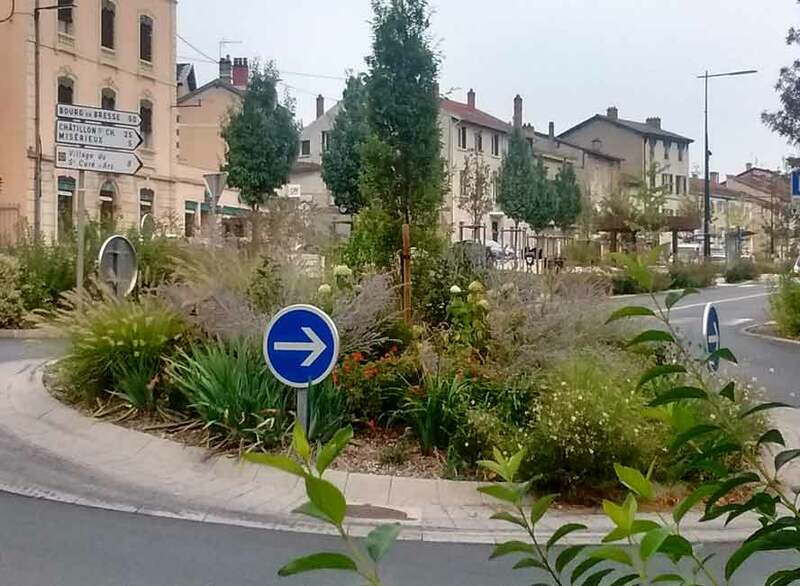 Just outside a tiny French village, another roundabout combines subtle silver-green foliage with pale yellow Euphorbia and cool purple rock roses. The low lying, shrubby planting is punctuated with exclamation marks of darkest green Italian cypresses. Euphorbia characias subsp. 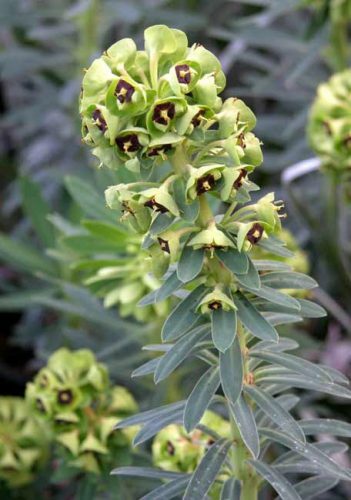 wulfenii, the Mediterranean spurge, is an upright plant, with grey-green leaves and whorls of chartreuse flowers. Euphorbia characias ‘Black Pearl’ is more compact, with distinctive black eyes. ‘Humpty Dumpty’ is smaller still, growing to only 60cm. 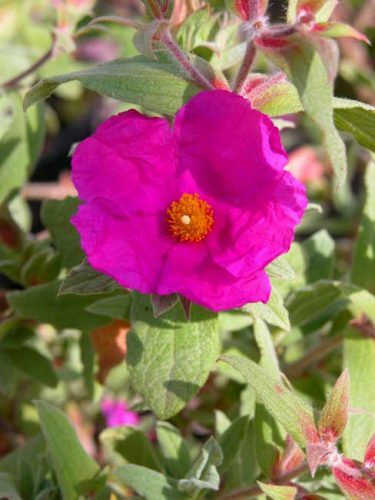 Cistus × purpureus (purple-flowered rock rose) is a bushy evergreen shrub, growing to a metre in height. The papery purple flowers have yellow centres and dark red blotches at the base of each petal. Cistus × pulverulentus ‘Sunset’ has clusters of yellow-centred, magenta flowers. Each flower lasts a single day, but the plant will flower its socks off all season long. 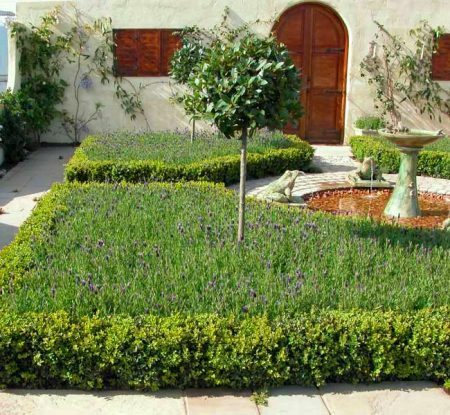 Lavender is a must for every Mediterranean style garden, with its aromatic grey-green leaves and scented purple flowers. 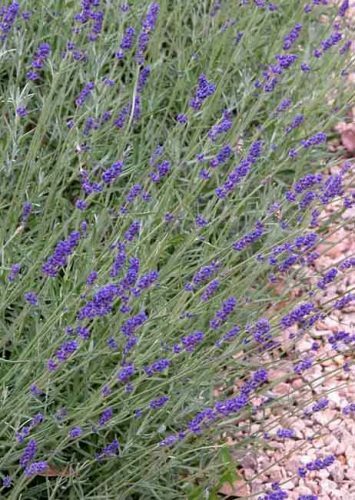 Lavandula angustifolia, despite its common name of English lavender, is a Mediterranean plant, of course, as the fields of scented lavender in Provence will testify. 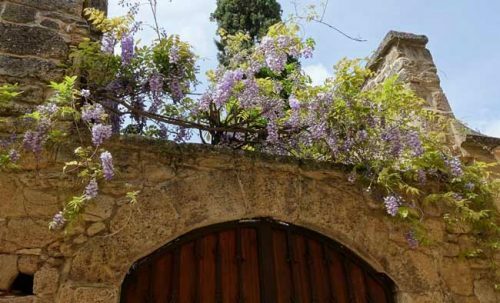 It could be the amazing Provençal light, making every wisteria-draped arch and blue-shuttered window look fantastic. 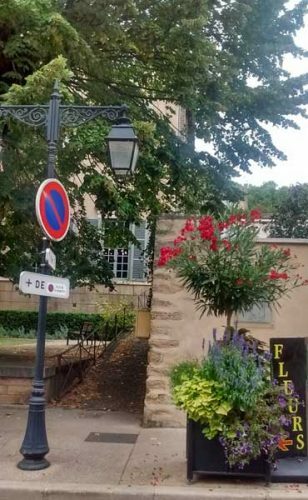 Or just the sun’s warmth down in the south of France bringing flowers to bloom which are still months away from flowering in the UK. 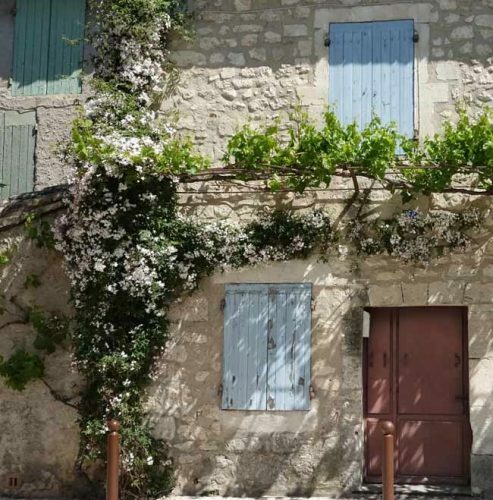 Or perhaps it’s the laid-back, holiday atmosphere, with breakfast on the terrace, surrounded by terracotta pots and topiary box, or an afternoon coffee with a tarte citron under the awning of a local patisserie. Whatever the impetus, like so many others, I’ve returned with a burning desire to recreate a bit of the Mediterranean in my back garden. 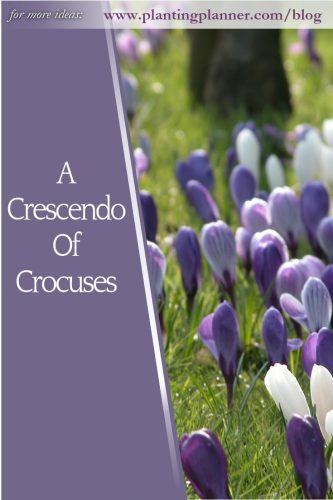 Read more about Creating a Mediterranean Garden here. May 1st – International Workers’ Day or Labour Day – is a public holiday in many parts of the world. It coincides with the much older traditional festival of May Day – springtime festivities, associated with May Queens and ribbon-dancing around the maypole. 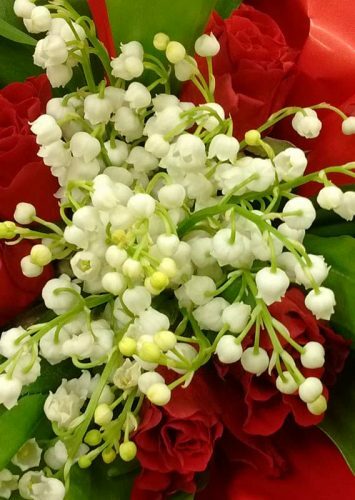 In France, it is also the Fête du Muguet, the day when the little Lily of the Valley, with its delicate sprays of white bells, is elevated to the position of celebrated star for the day. The earliest May Day celebrations honoured the ancient Roman goddess of flowers, Flora, and flowers inevitably feature in many of the traditions associated with this day. Traditionally, “May baskets”, containing flowers or sweets, were given at this time of year. They would be hung anonymously on the doors of friends or neighbours. A May crowning – honouring the Virgin Mary, by placing a crown of flowers on the head of her statue – takes place in many Roman Catholic parishes. Young girls in white dresses carry flowers to place on the head of the statue. 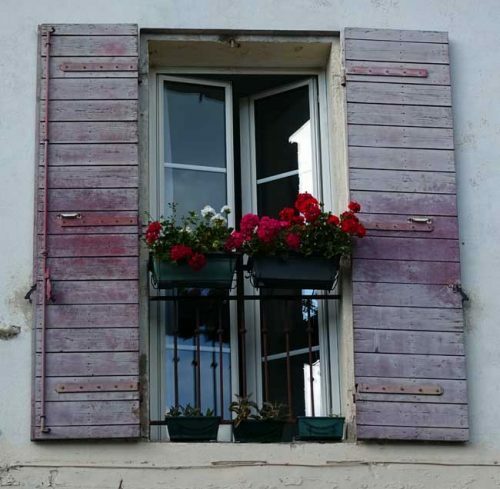 Throughout the month of May, the flowers may be replaced to keep them fresh. 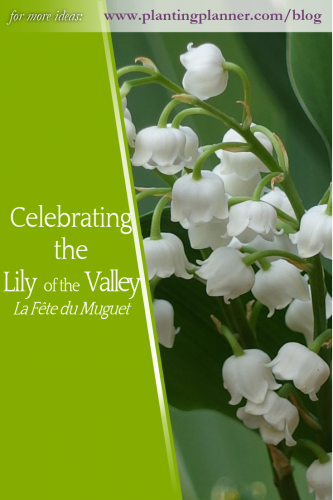 A charming tradition, in France, is La Fête du Muguet, the festival of the Lily of the Valley. It dates back to the 16th century and is associated with the ill-fated Charles IX of France, son of Catherine de’ Medici. The young King Charles – he acceded to the throne at the age of 10 and died before reaching the age of 24 – was prone to illness and dementia. He suffered from fits of violent, mad rages and was responsible for the massacre of thousands of Huguenots, in what became known as the St. Bartholomew’s Day massacre. Despite his gruesome history, however, he has left behind a much more pleasant legacy. In the spring of 1560, the young prince was apparently presented with a sprig of the sweetly scented lily of the valley (muguet in French) as a lucky charm. He was so delighted with the gift that, each year on the same day, May 1st, he gave sprigs of lily of the valley to the ladies at court. 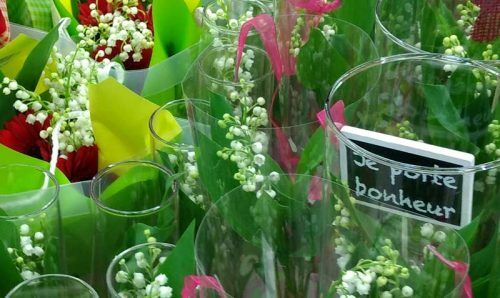 The custom continues in France, with fragrant posies of lily of the valley being presented to loved ones as a token of appreciation or good luck charm on 1st May. 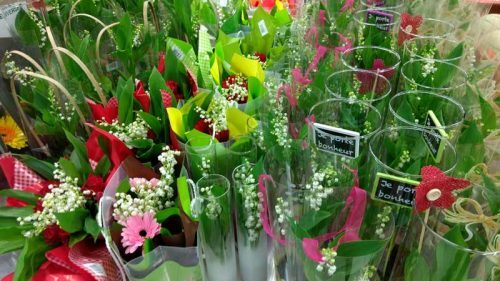 Street stalls and supermarket shelves are laden with little pots and tall, elegant vases containing sprays of the dainty, bell-shaped flowers, rising from a scroll of bright green leaves. More than 75 million sprigs of the flower will be sold across France for the Fête du Muguet. The tradition has been incorporated into Labour Day activities too. 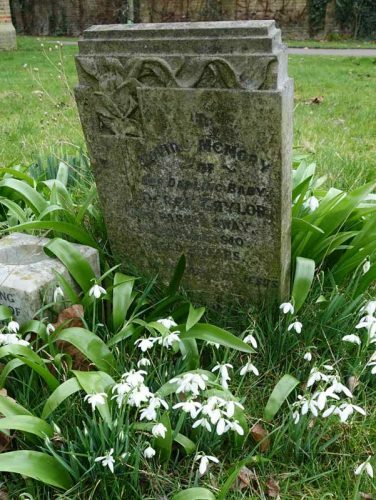 During the Second World War, a buttonhole of eglantine rose, which had been worn by marching workers as a symbol of the Left, was officially replaced by a spray of lily of the valley. 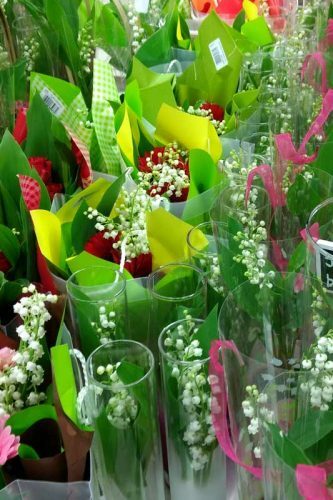 There are now special rules in France allowing lily of the valley to be sold on May Day without the usual taxes having to be paid, provided the flower is homegrown or gathered from the wild. Fortunately, the little plant’s propensity to spread by means of underground runners, means that it copes well with any amount of cutting back and will continue to bloom undeterred in subsequent years. 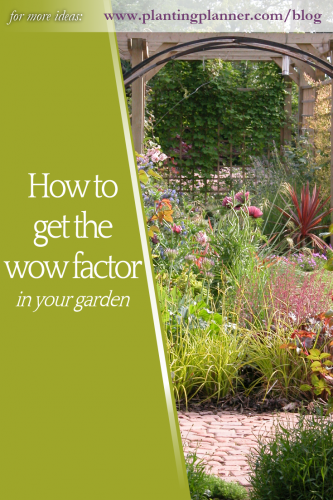 Looking for the wow factor? 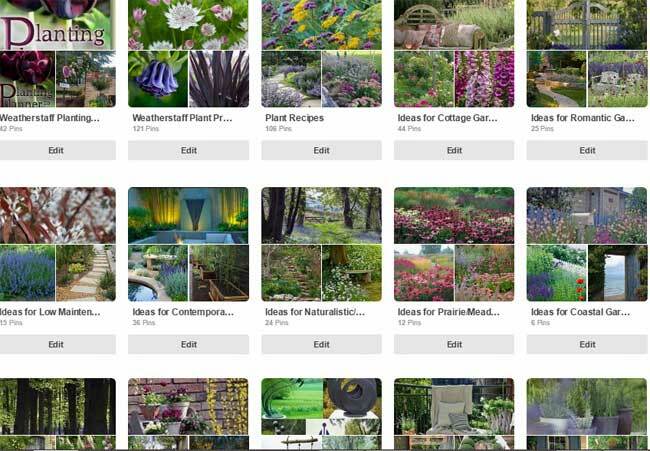 There are thousands of searches on the internet every month for ‘garden border ideas’. That must mean that an awful lot of us are looking at our flower beds and feeling a little disgruntled by what we see! There might be a collection of perfectly nice plants in our flowerbeds but somehow the wow factor is missing. The first step is to decide on the style of garden you prefer. 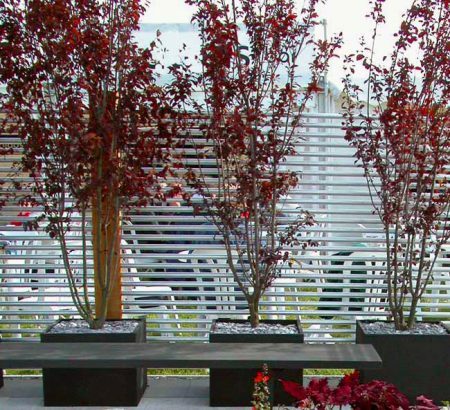 Are you a minimalist, in search of contemporary planting ideas and modern materials? 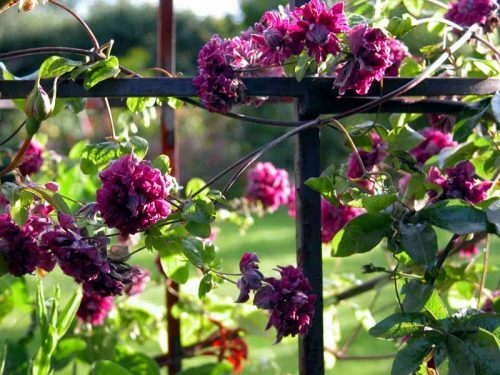 Or do you have a passion for cottage gardens – billowing roses and white picket fences? 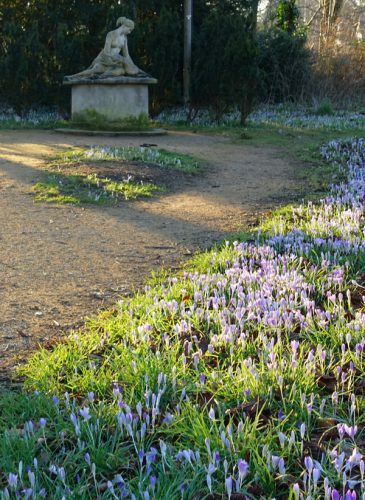 Perhaps you want to create a Mediterranean-style garden border or a shady woodland retreat? Read more here on different garden styles to help you decide. Now look back at your mood board of favourite images – which style of garden features most prominently in your chosen images? 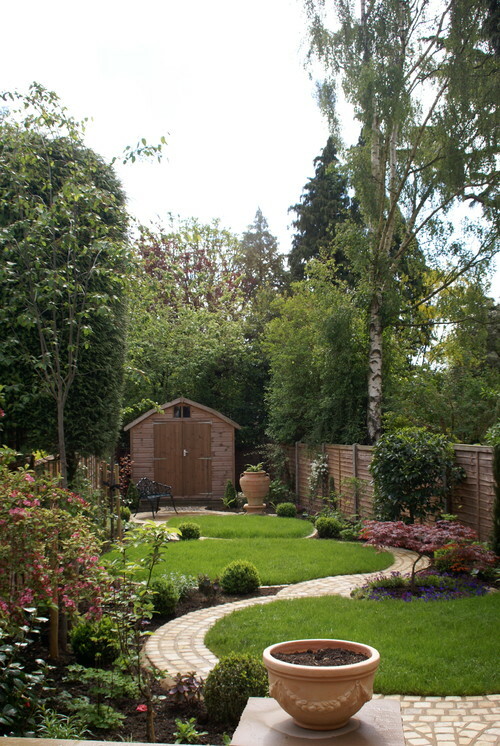 Is that the type of garden you would like to recreate in your own backyard? 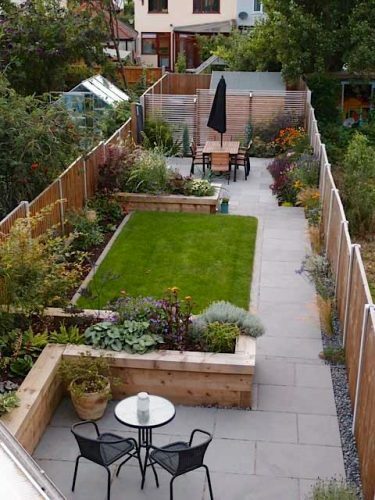 The next step is to consider the overall layout of your garden. Will you need to stick closely to the structure you have already or are you prepared to invest in some major restructuring, involving moving or laying new paths or seating areas, perhaps? Read more here about disguising awkwardly-shaped plots. 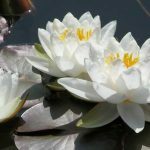 There are some changes you can make, without huge cost implications, such as widening a flower bed or tweaking the shape of a lawn. We were able to change the look of our triangular garden by rounding the lawn and losing the sharp angle amongst a sea of tall planting. 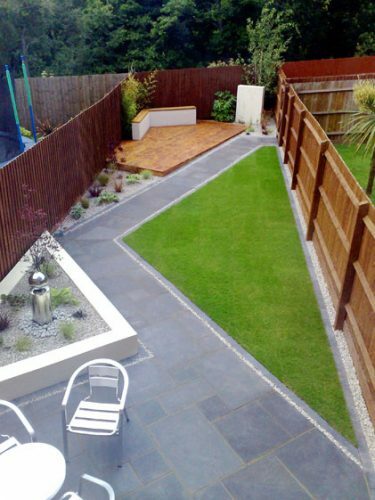 Before you head out with a garden spade, think first about whether you want to create a garden which is formal or informal in design. Do you prefer a naturalistic, informal look or do you hanker after the elegance of formal lines and symmetry? 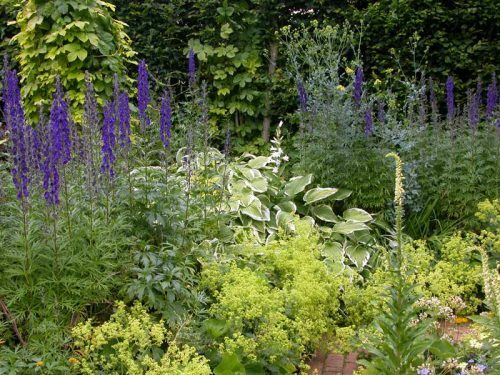 Have a look at the following design tips for creating a formal or informal style of garden border. The amazing, formal gardens at Villandry in the Loire valley are a great source of inspiration. You may not be able to create something on quite such a grand scale, but the elements of symmetry, geometric shapes and well-manicured topiary are the basis for a formal garden border. 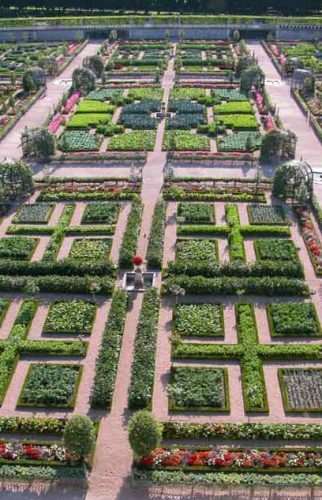 Choose straight lines and geometric shapes, such as circles, squares and triangles, to define planting areas. 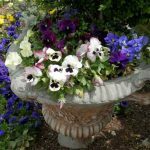 Aim for a symmetrical design, repeating planting and colours in matching borders or arranging features such as pots, fountains or obelisks in a symmetrical pattern. 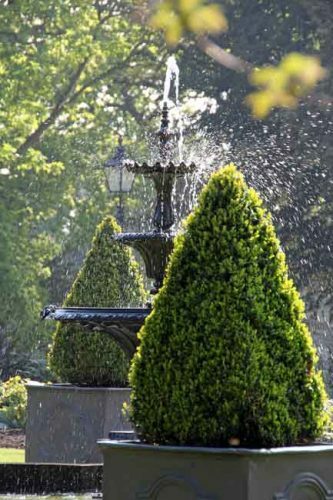 Formal gardens need to be carefully maintained, hedges and topiary well-clipped and borders neatly edged. 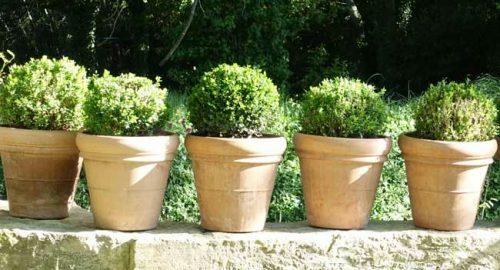 Containers of topiary in neat geometrical shapes sit well in formal designs. Use gentle curves, rather than straight lines, to define border edges. Planting can be allowed to spill over the boundaries of flower beds to break up hard edges. 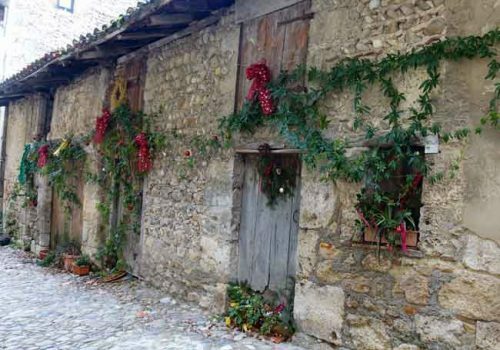 Use natural materials, such as wood and weathered stone, if you can. 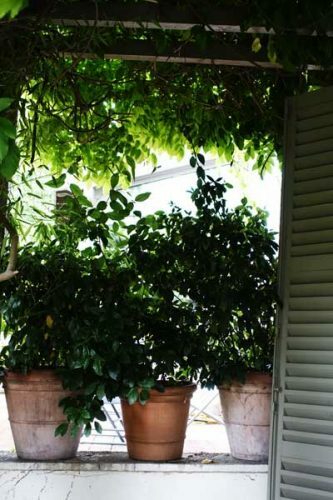 Collections of pots and containers in a mix of heights and sizes create a natural look. So, you’ve decided on the style and layout of your garden. Take another look at all those beautiful images you’ve collected. Chances are the most important feature in those pictures is the choice of plants. The crucial step to making your dream garden a reality is getting the planting right. 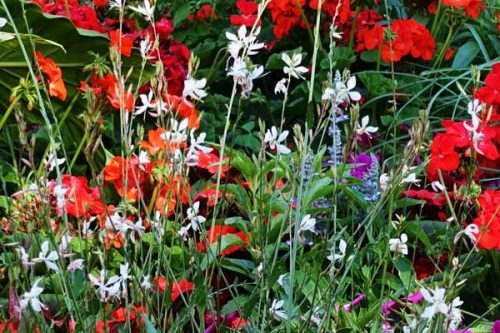 Take time to study the plants used in the flower borders and how they are combined to great effect. 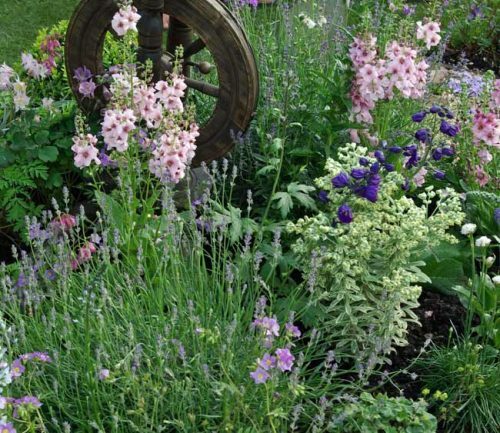 Try placing plants in groups or drifts – an odd number usually works well. Contrast tall plants with low mounds. Choose plants for all year-round structure as well as summer colour. Spires and mounds work well in a planting plan. Getting the planting right can be tricky. 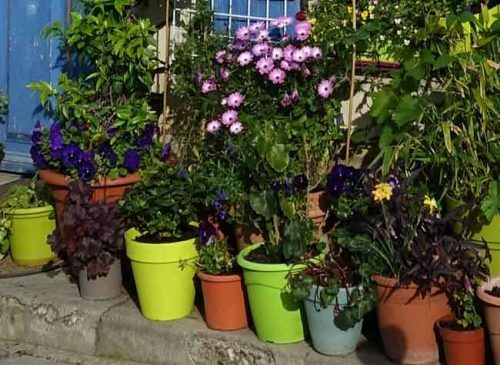 Many home owners have spent a small fortune in garden centres only to find that the plants they have chosen aren’t suitable for the growing conditions in their own gardens. Related post: How much did you spend the last time you went to the garden centre? 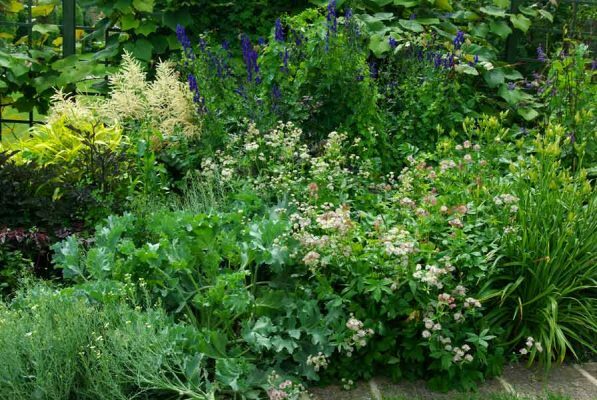 It’s a good idea to check on the acidity of your soil and take time to work out whether your borders are well-drained or water-retentive, sunny or shaded, as these factors will affect which plants will thrive in your borders. 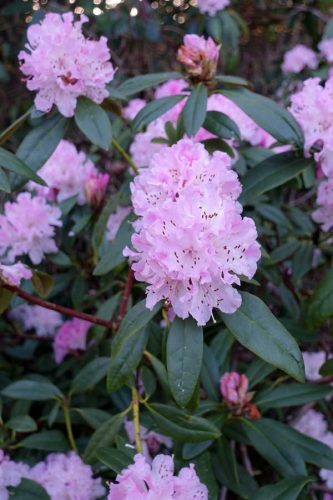 Read here for more on my endeavours to create a successful planting plan. Related post: What makes a successful planting plan? 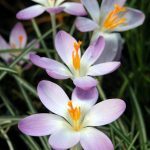 Need help choosing the right plants? The Weatherstaff PlantingPlanner makes it easy for you to create beautiful garden borders. 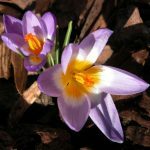 The interactive gardening software designs all-season planting plans, tailored to your garden’s soil and light conditions. Draw your garden layout using the onscreen drawing tools. Select your choice of style and preferred colour scheme. Enter your garden’s climate, soil and light conditions. That’s it! 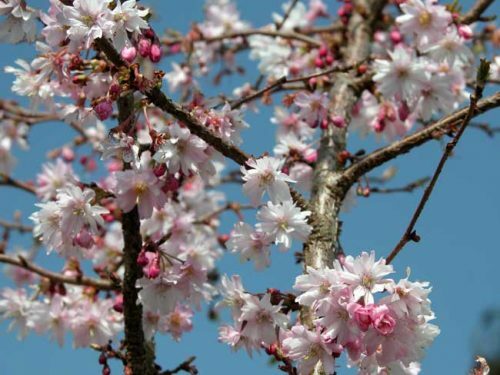 The PlantingPlanner will generate your bespoke planting plan, complete with colour photographs, descriptions and full maintenance advice for individual plants. You can tweak and modify your generated plan, by excluding any plants you don’t like and substituting them with your favourites. The PlantingPlanner will tell you if your choices are suitable for your location. Find out more here. We ended up making the lawn area smaller, with a more curvy shape, by lopping off the tip of the triangle. We laid stepping stones to create a winding pathway up to the tip of the triangle and used taller planting to obscure the shape. The planting has started to fill out. As the planting started to become established, the stepping stones began to disappear into our secret garden. We planted a pair of columnar silver birches, their narrow lines perfect for small gardens, and used plants which naturally favour woodland conditions. It has become our wild area – not least because it’s not so visible from the house so is always last on the weeding list! 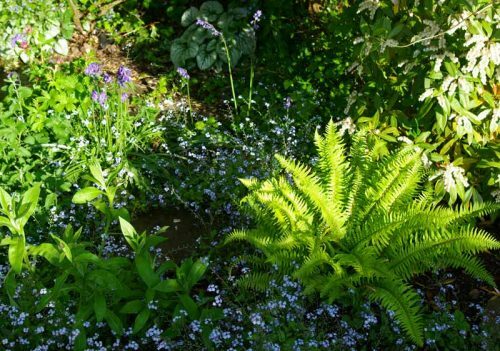 This area of the garden is glorious in spring, when the aquilegias, candelabra primulas and forget-me-nots are all in flower. In summer, the geraniums, hydrangeas and persicaria do well. I tried hostas up here, as they are a perfect choice for a shade garden, but they were too far from the house for me to remember to slug-proof them and I decided to move them nearer to the back door where I could keep a wary eye on them. Over time, the shrubs have grown tall and the planting has become dense and overgrown. 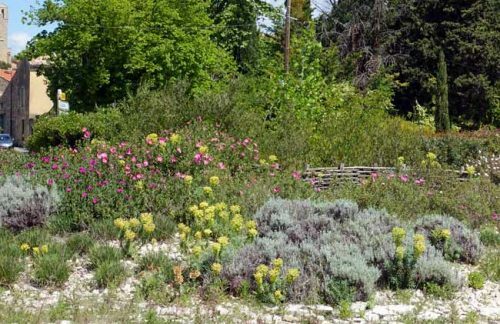 It’s definitely time for another make-over – or at least, a good sort-out and pruning session, but the basic structure and pathways are still good and I’m happy that the garden no longer looks too angular. Changing the shape of features such as lawns and planting areas can help disguise unusual shapes and smooth out sharp angles. Circles (or even octagons) make interesting lawn shapes as they create intriguingly-shaped borders around their edges and draw the eye away from the less-than-perfect outline. 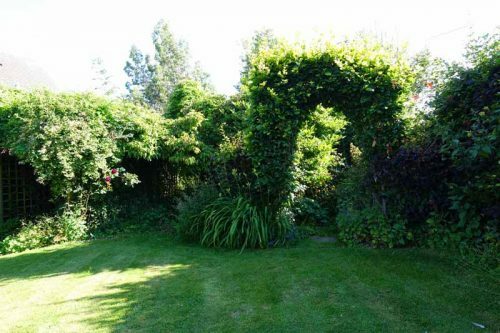 Splitting up the overall garden into sections, especially where there is a journey to follow to reveal each part, can be a clever way to disguise an unusual shape. I appreciate that dealing with a triangular garden is not a problem too many people have. 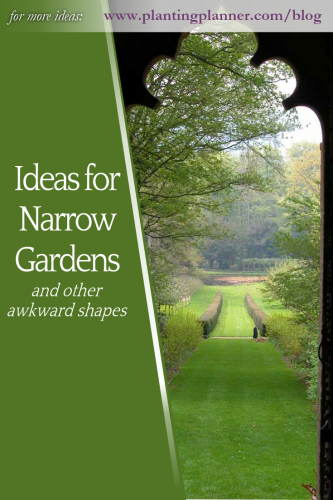 A much more common garden shape is the long, narrow plot and the geometrical puzzle becomes how to make a narrow rectangle look like a circle – or even a square! If you have a grand estate to play with. long, straight vistas are rather wonderful. 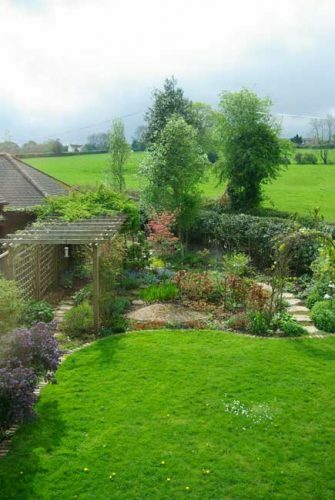 But in a ‘normal’ back garden, the idea is to break up the linear view. 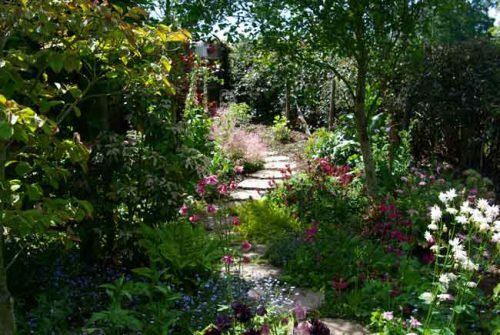 So instead of laying a path which runs straight down the length of the garden, create sinuous, walkways, with interesting features along the way, to create different vantage points as you walk through the garden. 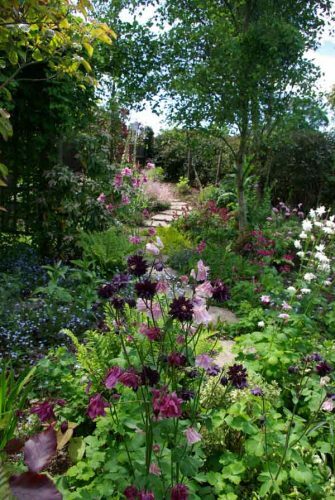 Place a path, seating area or pond widthways across the garden. 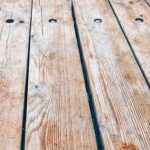 Lay an area of decking so that the planks lie across, instead of down the length of, the garden. 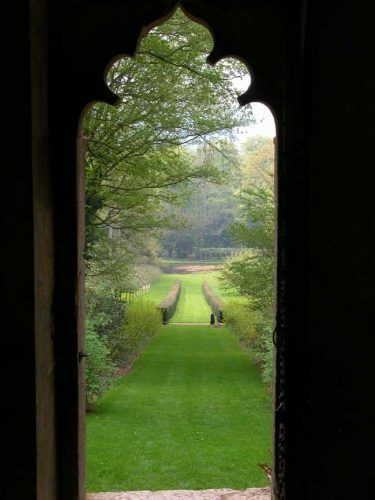 Place large objects, such as urns or a sundial, at the edges of the plot,to draw the eye across, instead of down, the garden. Think about setting paths and open spaces, like a lawn or sitting areas, on the diagonal. 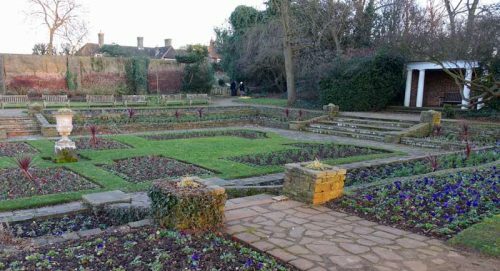 Long gardens can benefit from being split into sections horizontally, with each section given its own distinctive role and style e.g. an alfresco dining area, a lawn area, the kitchen potager. 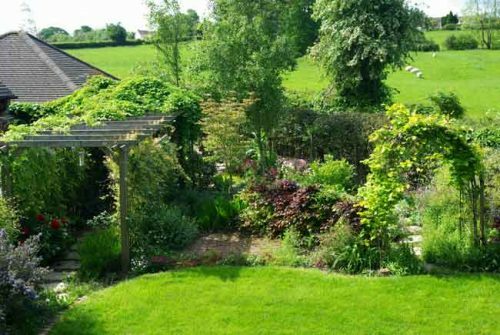 Garden designers often recommend building in ‘obstructions’, to prevent the whole garden being seen at once. Try adding arches, obelisks or fencing panels, clothed with climbers, so that each section of the garden is revealed in turn. 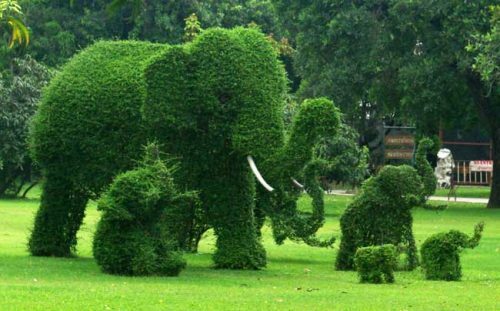 Tall planting can also be used in this way. 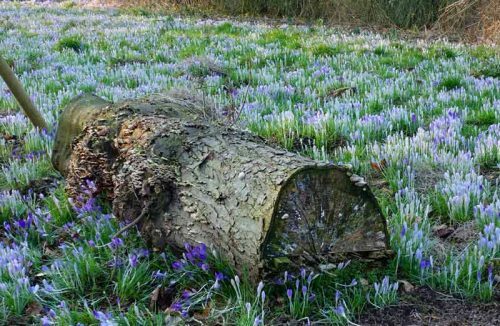 Once you’ve got the basic structure right, it’s time to think about updating tired garden borders or choosing plants for new flower beds. For plantaholics, that’s where the fun begins! If you need help selecting plants to make a stylish border, you could try The Weatherstaff PlantingPlanner. 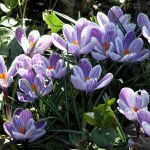 This interactive gardening software designs all-season planting plans, choosing plants which are tailored to your garden’s growing conditions. You can satisfy your inner garden designer by tweaking and modifying each plan until it is just how you want it to look! 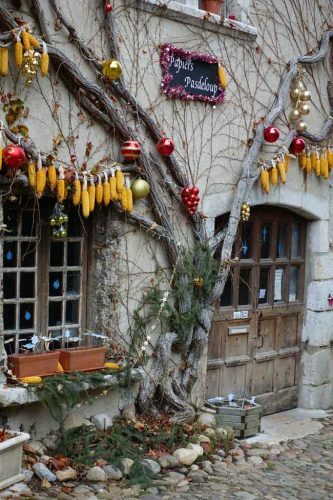 Decorating the house walls above them, traditional bunches of sweetcorn, together with gold and red baubles, were tied onto the winter vines, adding a splash of vibrant colour amongst the fading vines. By early January, the spidery flowers of Hamamelis x intermedia are starting to appear, while the delicate pink blossoms of Prunus x subhirtella ‘Autumnalis Rosea’ – the winter flowering cherry – appear in mild spells throughout the winter months. 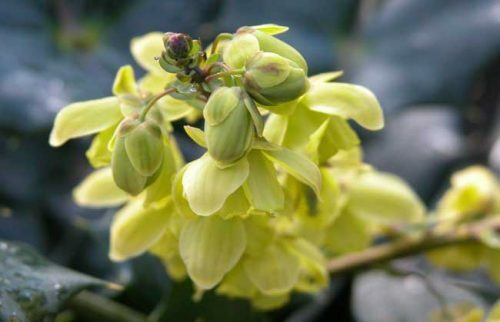 Mahonia is a useful winter plant with evergreen leaves and fragrant lemon-yellow flowers. Winter jasmine – Jasminum nudiflorum – is a vigorous climber, with yellow flowers providing a cheery sight on grey days. Viburnum x bodnantense ‘Dawn’ carries pretty, pink flowers for months through autumn and winter, while the peony-like ruffles of Camellia provide handsome clusters of colour in late winter and early spring. 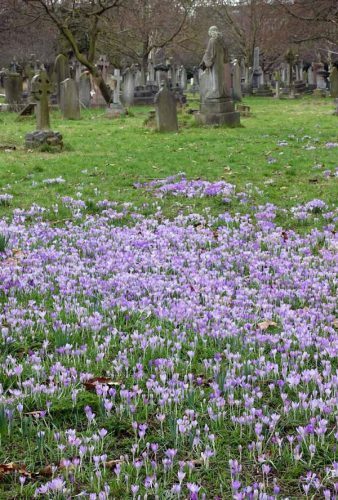 And with snowdrops starting to open and green shoots of early-flowering daffodils poking up from the ground,it will be spring before we know it! A trip to the local garden centre is a great pick-me-up at any time of year, but on a chilly November day it was a heart-warming experience! Fairy lights twinkled and deliciously cute, fluffy rabbits waved from their glittery warrens as I passed through the Christmas grotto and out into the plant sales area. 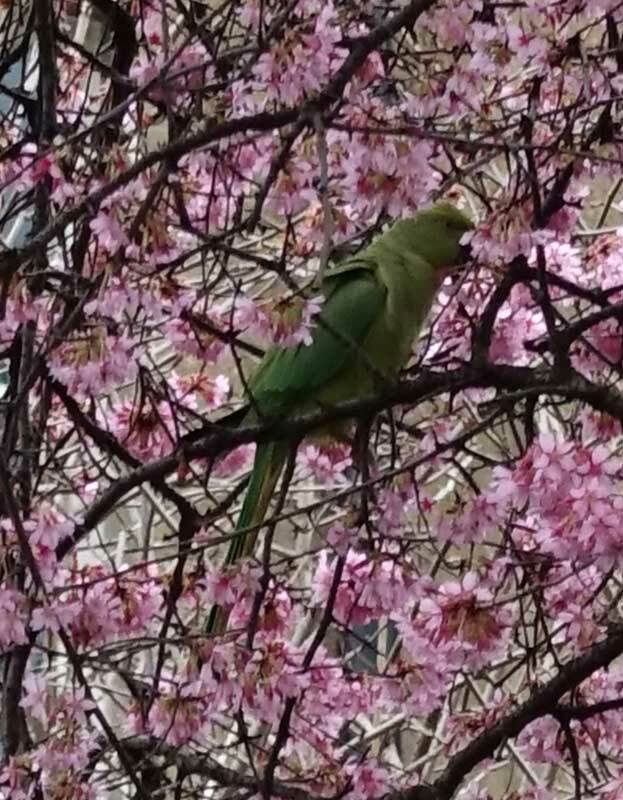 Of course, there wasn’t the huge array of colourful flowers you’d find at other times of the year. Still, there was plenty of choice for garden lovers hoping to cheer up their winter flower beds – or front door steps! Pots of young trees and evergreen topiary are superb for creating structure at the time of year when many of the perennials are fast retreating underground. I also spotted a good selection of autumn/winter flowering and berrying shrubs. These included both white and red berried Gaultheria and Callicarpa bodinieri var. 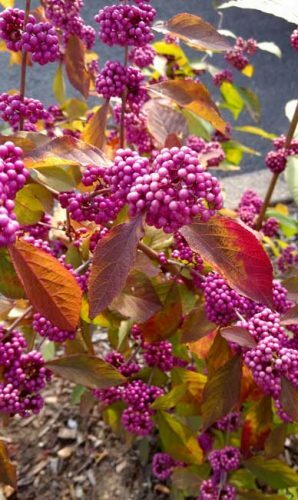 giraldii ‘Profusion’, which has colourful autumn leaves and violet berries. 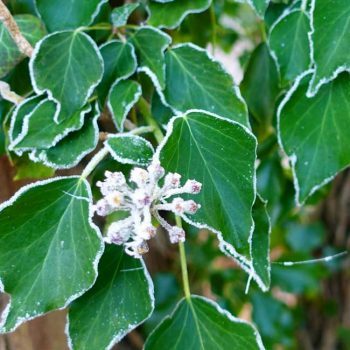 Plants don’t grow much during the winter months, so to make an immediate impact, it’s important to choose enough plants to look good right from the start. The first step is to choose the focus plant. After that, it’s relatively easy to create an effective arrangement – just keep pottering around the shelves, picking out plants and trying out different groupings, until you find the perfect combination! 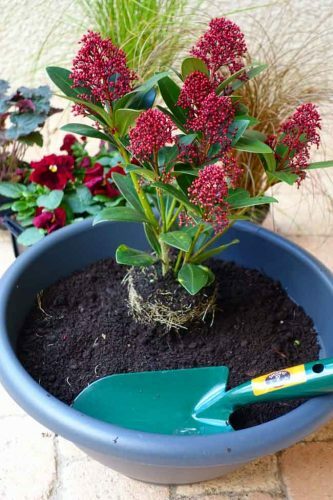 For structure, I chose a striking Skimmia japonica, dripping with red flower buds, together with a couple of ornamental grasses. 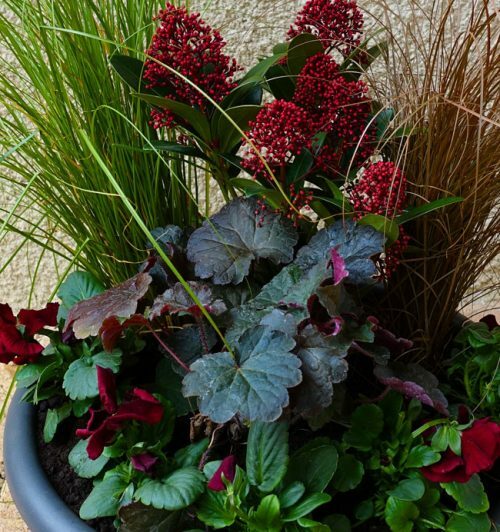 I picked up a heuchera with dark purple evergreen foliage, which would look stunning in my slate grey pot. It wasn’t labelled so I’ll have to wait till summer to find out what the flower looks like! Finally, a collection of winter pansies found its way into my trolley. There was a huge choice of cheerful colours, both single and bi-coloured, but I liked the sultry deep red-purple ones, that complemented the other plants in my trolley. Back in the warmth again, I got side-tracked on the way to the till by the spring bulb collections and ended up throwing in a packet of Narcissus ‘Tête-à-Tête’, which also included some free Iris reticulata bulbs. Narcissus ‘Tête-à-Tête’ only grows to about 15cm so is perfect for small pots. It has slightly reflexed, golden petals, with deeper golden cups. Twin flowers, sometimes triplets, are carried on each stem in early spring. The beautiful iris reticulata flowers in late winter to early spring, growing to 12cm high. 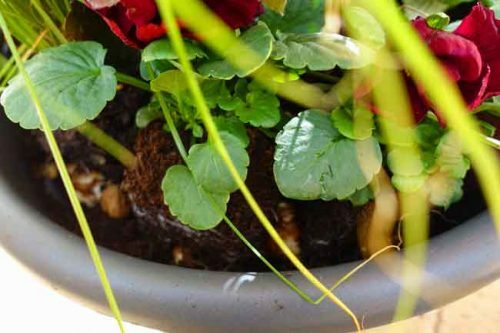 I found some small stones to sit over the pot’s drainage holes, to prevent them from getting clogged up with soil, and added a layer of compost. Then it was time to be creative. The Skimmia japonica went in at the back, flanked by the two grasses. Before adding the smaller plants, I planted a handful of the bulbs as deeply as I could. 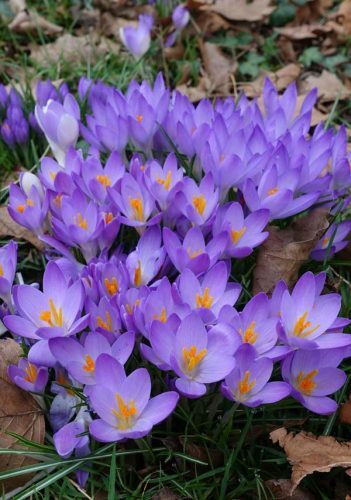 Bulbs need to be planted at 2-3 times their depth and one bulb width apart. My container wasn’t as deep as I would have liked, but I’ll hope for the best! To finish off my winter pot, I added the remaining plants. The heuchera went in front of the skimmia and the pansies squeezed in around the edge, where I hope they will flower their little socks off in milder spells throughout the winter. 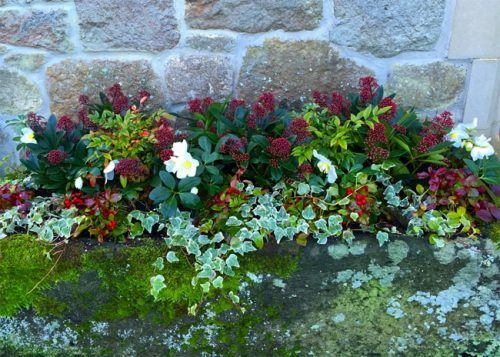 Gaultheria’s red berries, purple-red Skimmia flower buds and the fiery winter foliage of evergreen Nandina domestica line this weathered stone trough. Trailing variegated ivy softens the edges while the Christmas rose (Helleborus niger) adds a splash of winter white. Gaultheria is an acid-loving plant, so to do well will need ericaceous compost. 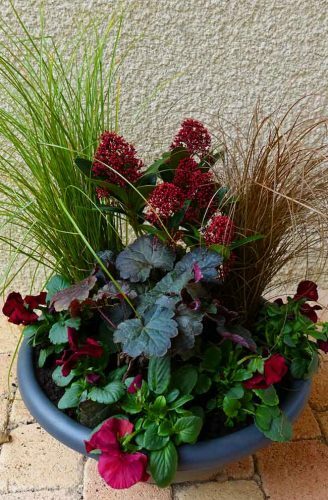 It’s easy to give plants the conditions they need in containers, so if you love a plant that won’t survive in your garden soil, planting up a container is a good way to fit it in. Senecio cineraria and cyclamen are happy in all soil types, so they make good companions for the Gaultheria. 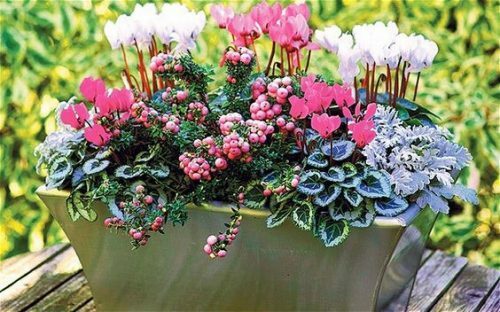 Not all cyclamens are hardy, so it’s best to choose hardy Cyclamen hederifolium or Cyclamen coum for your winter pots. There were plenty of ornamental cabbages in the garden centre, which I passed by without too much hesitation. They just seemed a bit too clunky for my liking. 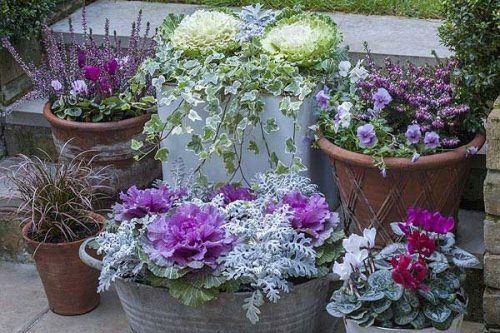 However, in this collection of winter containers, the delicate spires of heather and the fine filigree of senecio balance the heavier purple cabbages. The cyclamens and ivy help to tie the display together. For the easiest of winter pots, try some box balls, cones or pyramids. 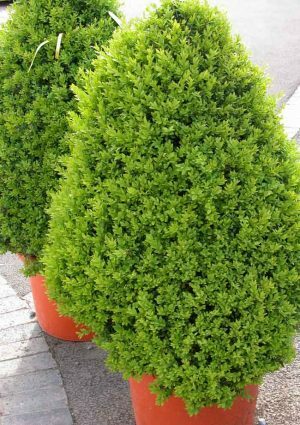 Box (Buxus sempervirens) grows from mid-spring to early summer. 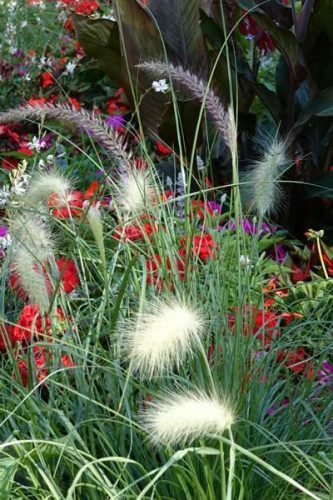 It will need trimming in mid-summer to maintain its elegant shape but will provide year-round structure in the garden. Looking for more ideas? The RHS has more advice here on suitable plants for winter containers. 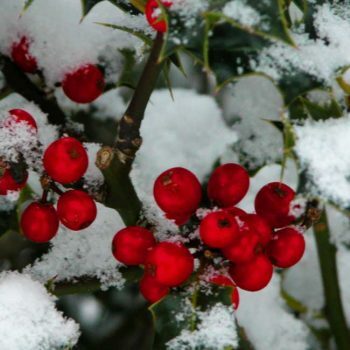 Plants don’t need feeding in the winter months, but they will need watering in dry, mild spells. Standing pots on bricks or pot feet will improve drainage and may help protect pots from cracking in icy conditions. 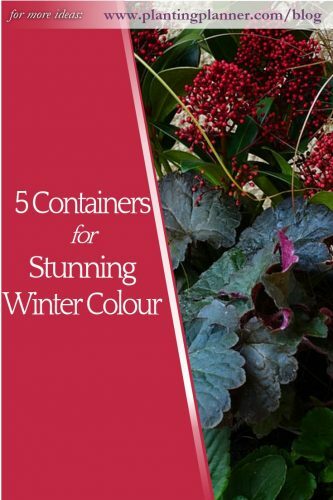 Place the container where it will get the best of the winter sun. 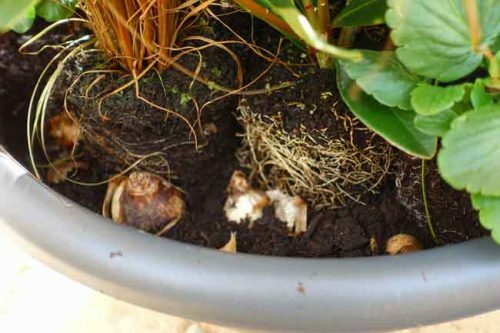 In severe weather, move pots to a sheltered spot or wrap in horticultural fleece or bubble wrap. 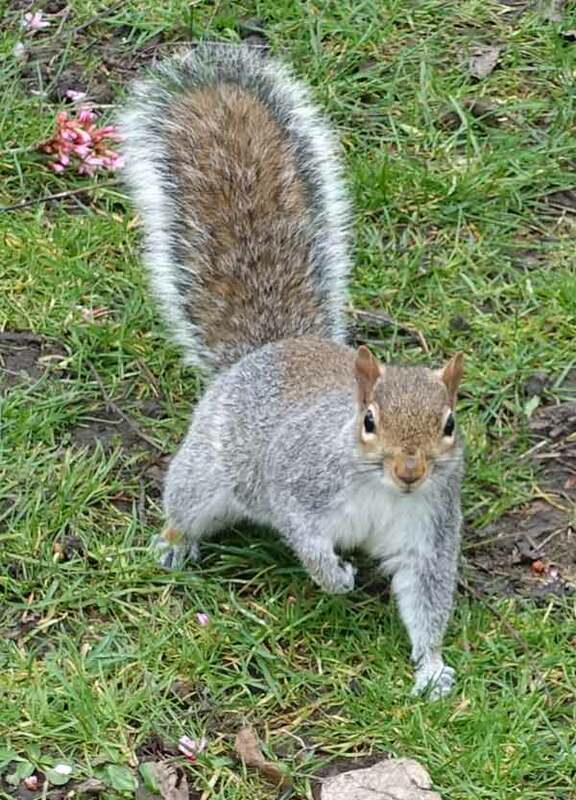 ‘Pipsqueak’ has yellow rays surrounding a velvety yellow and brown central disc. The rays are relatively short and reflex very strongly, giving extra prominence to the central cone. 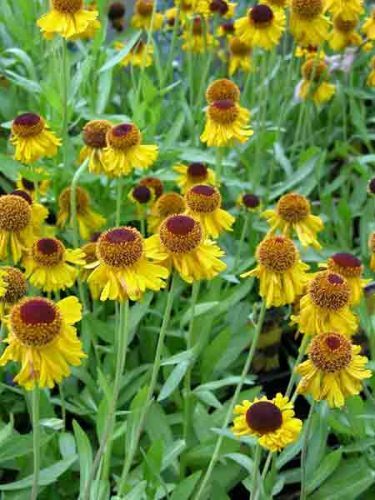 Another award-winning Helenium is ‘Waldtraut’. 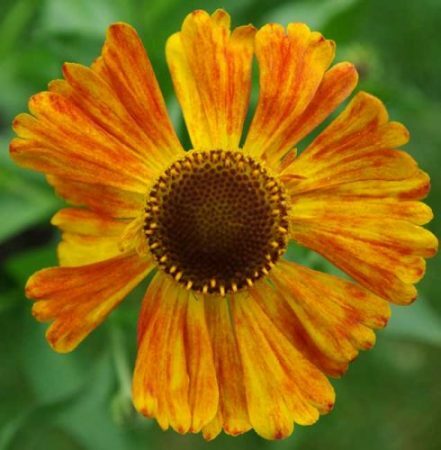 The flowers have a velvety brown central disc, surrounded by coppery-orange rays, streaked yellow. Helenium appreciates moist, well-drained soil in full sun. Cutting back the stems towards the end of May by about one-third should promote better flowering on more compact plants. A superb, late-flowering perennial, spreading slowly by means of rhizomes. A mass of golden, daisy-like flowerheads are carried on upright stems from late summer to mid-autumn. The flowers have prominent black-brown, cone-shaped discs. 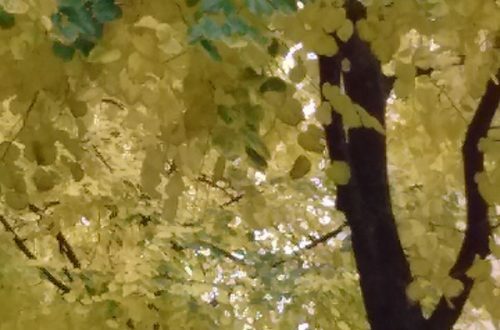 These become an interesting feature in their own right when the glorious, yellow ray-florets have fallen. 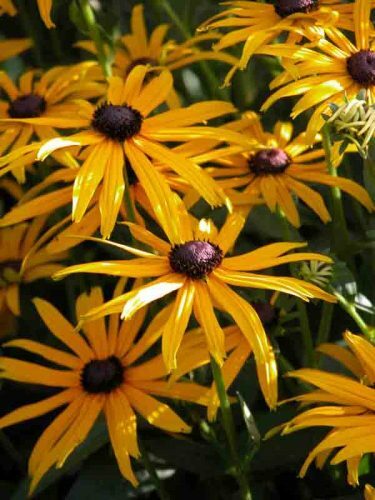 Rudbeckia likes moist, well-drained soil in sun or part-shade. Divide every 4-5 years to maintain vigour. 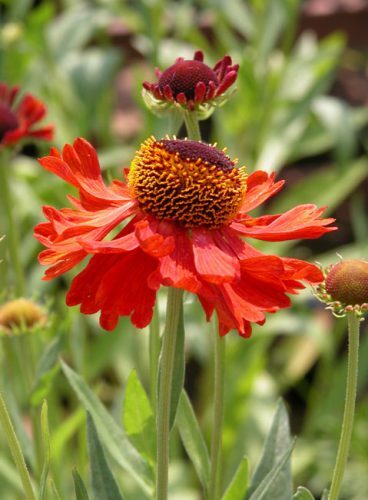 Like Helenium, these too can be cut back at the end of May to encourage flowering. 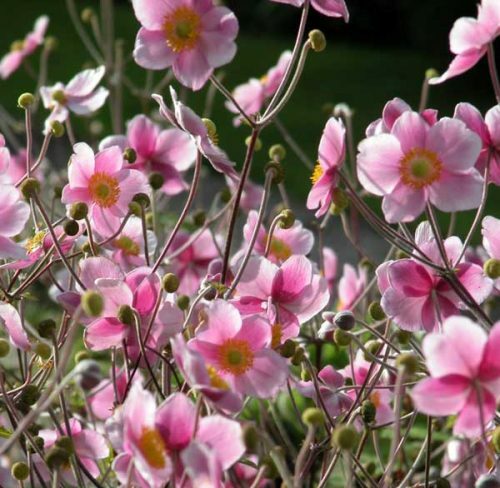 Japanese anemones are vigorous, upright, perennials, bearing numerous flowers in late-summer to mid-autumn. Anemone x hybrida ‘Königin Charlotte’ has soft pink flowers, while ‘Honorine Jobert’ has pure white, single flowers, with rich yellow stamens. 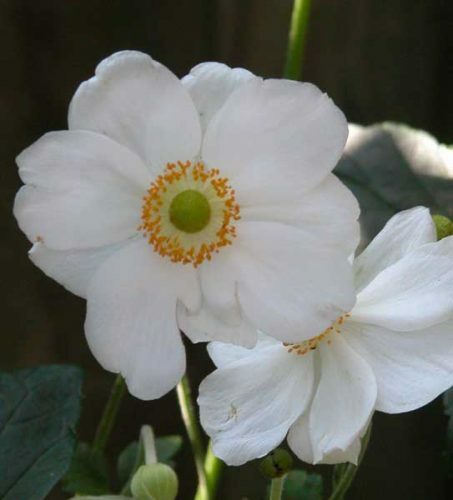 Happy in moist soil in sun or part shade, japanese anemones will spread to cover bare soil. Pull up rooted suckers to curtail its spread. 29th September is Michaelmas Day, the feast of Saint Michael the Archangel. 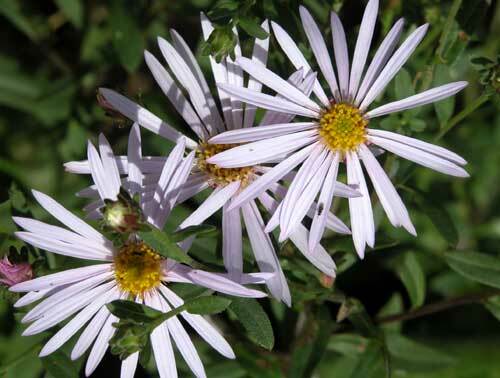 The Michaelmas daisies flower around this time, with sprays of daisy-like flowerheads from late-summer to mid-autumn. 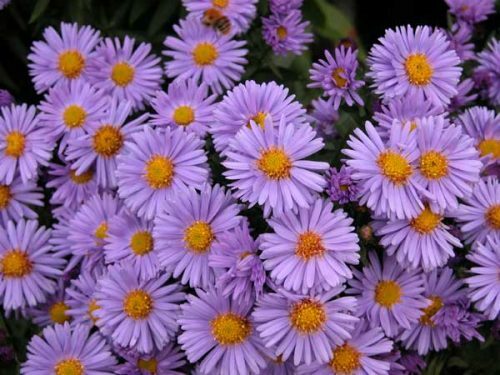 Many suffer from powdery mildew, so look out for Aster novae-angliae varieties, which have relatively good mildew resistance. My favourites are the starry, pale lilac flowers of Aster pyrenaeus ‘Lutetia’, and, as an added bonus, they are completely resistant to powdery mildew. A great late flowering garden plant. 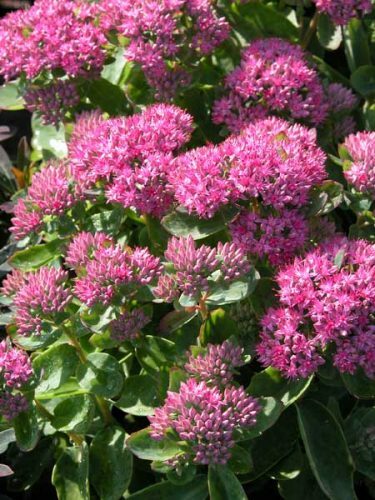 The sedums also bring interest to autumn flower beds, with the colours often getting better and better as the season passes. 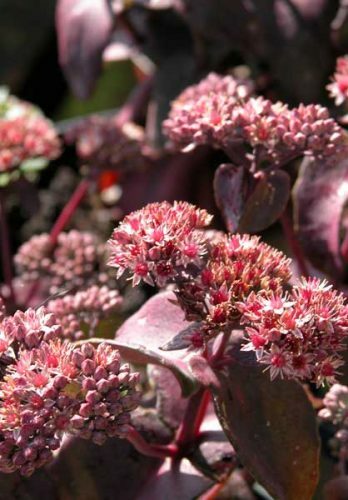 From late summer to mid-autumn, Sedum telephium ‘Munstead Red’ has clusters of starry, deep pink flowers, with purple-red centres, darkening with age. The upright plant has green leaves, flushed purple, on bright red stems. Seedheads persist over winter, prolonging the season of interest. ‘Purple Emperor’ has pale pink flowers, with deeper pink centres, while the dark red-purple leaves on ruby-red stems bring a royal richness to garden borders. 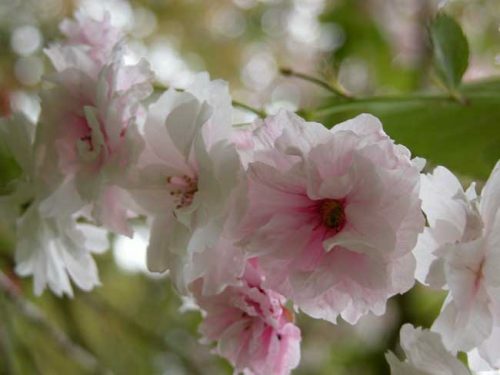 ‘Matrona’ has pale pink flowers, with rose-pink centres. 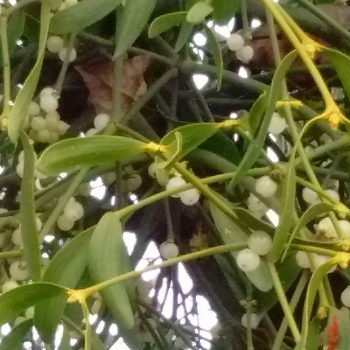 Green leaves, flushed purple, are carried on bright red stems. Sedum telephium subsp. 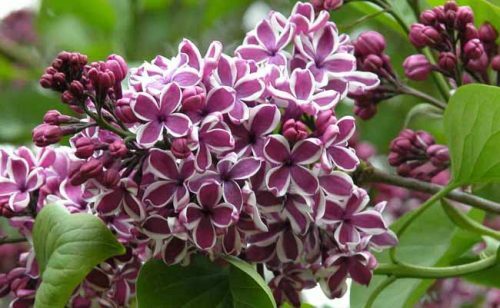 maximum ‘Atropurpureum’ has pink-white flowers, contrasting with dark purple leaves on purple stems. It has been awarded the Royal Horticultural Society’s Award of Garden Merit. 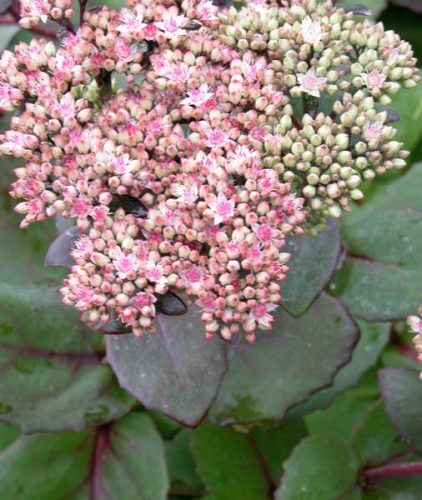 Sedums like well-drained, neutral to slightly alkaline soil in full sun. 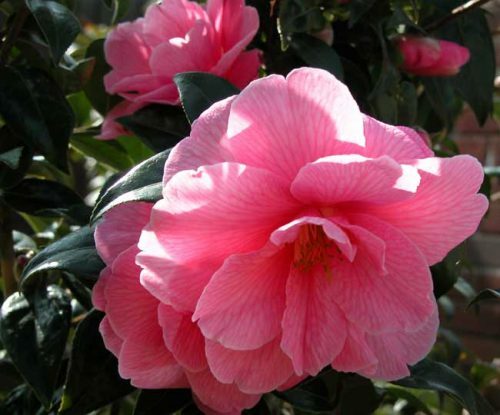 They perform well in poor or moderately fertile soil, as richer soil conditions encourage foliage growth rather than flowering. 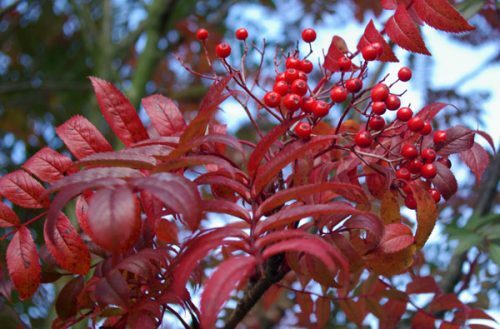 Need a Planting Plan for Autumn Colour? When planting up a garden border, it’s easy to end up with a one-season wonder. 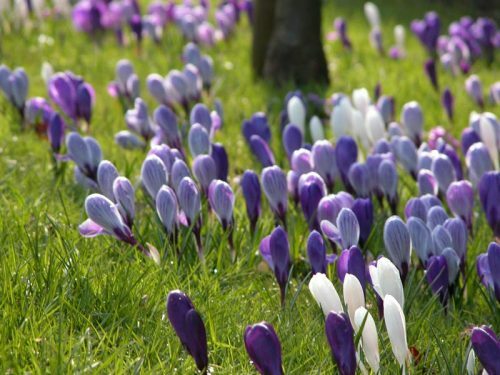 The flower beds are a delight in spring or early summer, but tail off at the end of the main flowering season. It can be hard to juggle all the factors which contribute to make a cohesive, all year round planting plan – finding plants which provide structure and interest in all seasons, complement each other, as well as thrive in the particular conditions you have in your own patch of earth. The Weatherstaff PlantingPlanner does all this for you, making it easy for you to create garden borders with all year round interest. Enter details of your garden’s soil and light conditions, choose your favourite planting style (for example: cottage or contemporary) and pick your colour scheme. 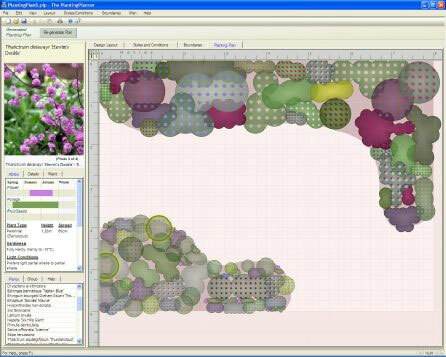 The intelligent garden design software will create a planting plan which is tailor-made for you. You can regenerate a plan or tweak it to add personal favourites. 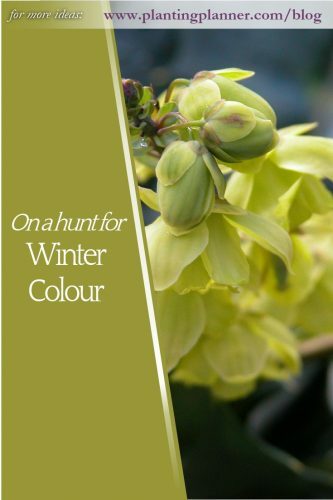 Let it bring out the designer in you, as you experiment with different colour combinations or scroll through the list of suggested plants to further personalise your design. 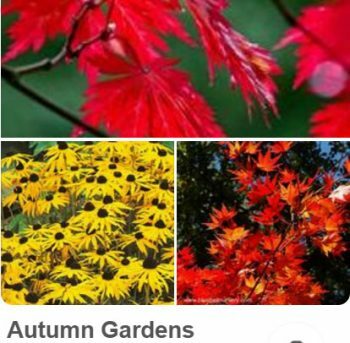 For more inspiration for your autumn borders, click here to follow the Weatherstaff PlantingPlanner on Pinterest. 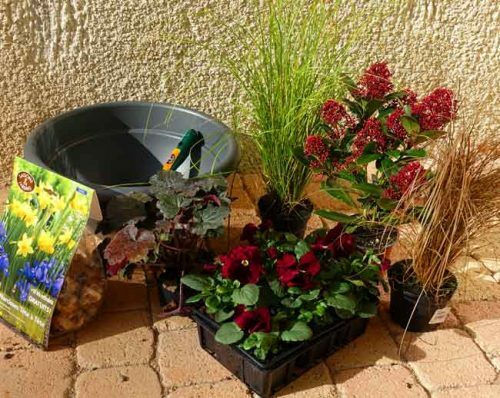 The PlantingPlanner can also be added to your ‘gardening gifts’ list. Read: Four compelling reasons why the Weatherstaff PlantingPlanner is the ideal Garden Gift. At every roundabout, there’s a new combination of flowers to admire. It’s hard to resist pulling up and leaping out of the car to admire the planting plans close up. 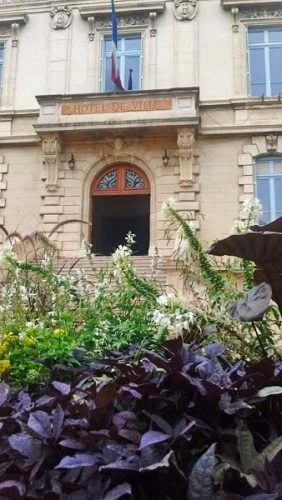 Outside the Hôtel de Ville, vertical height lends structure to the schemes, while the vibrantly contrasting rich purples and yellows are a source of inspiration for flower beds anywhere. Perhaps it’s the French sense of style? 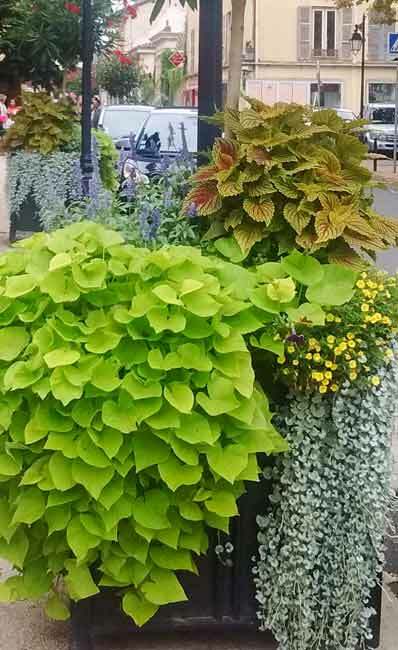 Certainly, their street containers are so much more than an attempt to add a splash of colour. 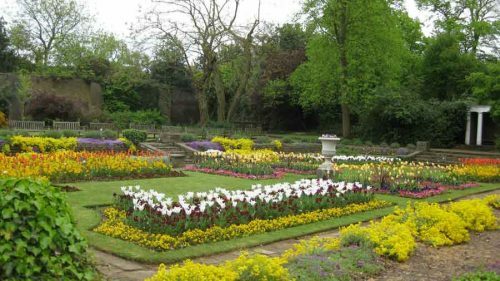 The designs are vibrant and contemporary, but there’s a restrained colour palette which avoids the often garish effect of summer bedding in some of our British parks. 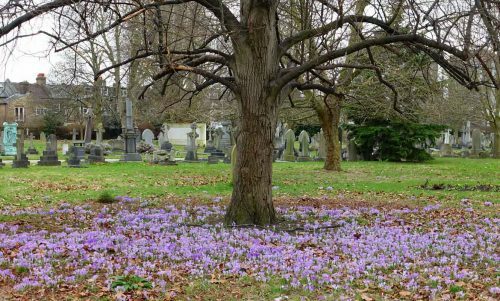 There’s no hint of municipal planting here – just a careful mix of perennials and shrubs that would look at home in someone’s back yard.